Laura Sánchez attended at the 10th Annual NGS & Clinical Diagnostics Congress in London, UK. 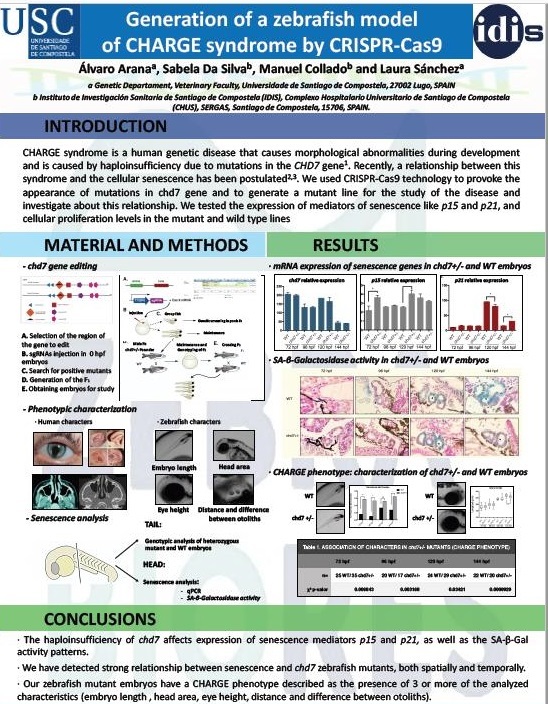 In this congress our PhD student Alvaro Arana Díaz presented a poster titled "Generation of a zebrafish model of CHARGE syndrome by CRISPR-Cas9". CHARGE syndrome is a genetic disease that causes morphological abnormalities during development and is caused by haploinsufficiency due to mutations in the CHD7 gene. The zebrafish shares most of the genes with humans, including the chd7 gene. Thus we used CRISPR- Cas9 technology to provoke the appearance of mutations in this gene, and to generate a mutant line for the study of the disease. Recently, a relationship between this syndrome and the appearance of typical characteristics of senescence, such as a high expression of mediators of senescence p15 and p21, and a low cellular proliferation have been observed. Embryonic senescence is a process involved in the development of organisms, whereas CHARGE syndrome is a disease that causes morphological abnormalities during development. Given this relationship, we generated a mutant zebrafish CRISPR line for the chd7 gene, to perform a phenotypic characterization of the mutants, and to study the process of embryonic senescence in the mutants, evaluating the expression of genes related to senescence: p15 and p21 ; in addition to the chd7 gene, and perform SA-β-Gal staining to observe senescence in embryonic tissues. Our mutant embryos have different patterns in the SA-β-Gal activity and different levels of expression of the mediators of embryonic senescence, with respect to the WT embryos, which become noticeable from 120 hpf.